NASA?s MarsReconnaissance Orbiter has suffered an apparent glitch that has left the spacecraftin a protective safe mode and stalled science observations as it circlesthe red planet, the space agency announced late Wednesday. The malfunctionoccurred on Monday when the orbiter unexpectedly rebooted its main computer andentered safe mode, an automatic safeguard designed to protect the spacecraftfrom further damage when it detects a glitch. NASAengineers are reviewing potential causes for the malfunction aboard theMars Reconnaissance Orbiter (MRO) in the hopes of resumingits science observations of the red planet. "Weare going to bring the spacecraft back to normal operations, but we are goingto do so in a cautious way, treating this national treasure carefully,"said MRO project manager Jim Erickson at NASA's Jet Propulsion Laboratory,Pasadena, Calif. "The process will take at least a few days." The Mars orbiter?smalfunction occurred Monday at about 7:25 a.m. EST (1225 GMT), when thespacecraft was flying behind the red planet as seen from Earth. While MRO has sufferedglitches that put it in safe mode five times since its 2005 launch, Monday?s malfunctiondoes not resemble any of those earlier glitches, NASA officials said. An initialanalysis suggests that the malfunction may have been caused by thedetection of a power surge that lasted between 200 nanoseconds and 41 seconds.The power surge may have been real, or it could have been a phantom reading,mission managers said. One theoryis that the MROspacecraft may have been hit by a cosmic ray, causing an erroneous powersurge reading for about nine microseconds, more than enough time to trigger thecomputer reboot, mission managers said. MRO flight engineersmanaged to partially revive the spacecraft late Monday, when they boosted itscommunication rate from 40 data bits per second to a level some 10,000 timesfaster. 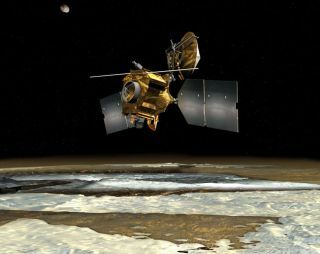 The spacecraft?s batteries are charged and its expansive solar wings aregenerating electricity, mission managers said. Launched inAugust 2005, the MRO spacecraft is NASA's youngest orbiter in a fleet of spacecraft circling the red planet. It arrived in orbit around Mars in October 2006 to begin a planned two-yearmission. The spacecraft?s initial $720 million mission has since been extended bytwo more years to 2010. During itstime at Mars, MRO has beamed home stunning vistas of the red planet and trackedNASA?s twin rovers Spirit and Opportunity as they explore the Martian surface. Thespacecraft has also used its high-resolution camera to scout for future Martianlanding sites and spottedNASA?s most recent probe - the Phoenix Mars Lander - as it parachuted downto a pinpoint landing on the planet?s arctic plains in May 2008.